Chicago, Illinois – In association with Chicago Artists Month, on Wednesday, Oct 29, 2014, Jack C. Newell and Seth Unger will debut to the public plans for their interactive public art light structure, The Wabash Lights. This interactive and informational reception will be held at the downtown office of Gensler Chicago. The event is open to the public. 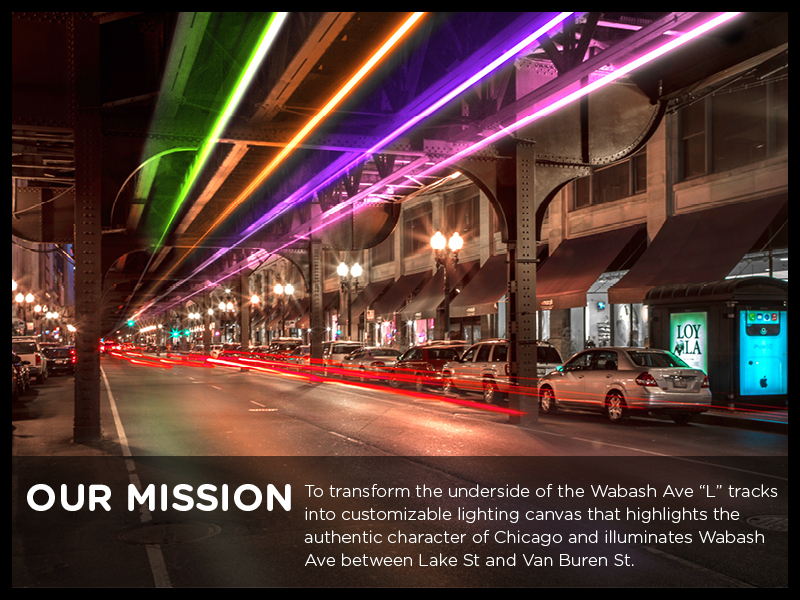 The Wabash Lights is a site­ specific lighting concept planned for the Wabash stretch of elevated train tracks (L) between Madison and Adams. The creators envision this work of public art will create a unique district in the heart of Chicago using the CTA’s L tracks as a canvas for a dynamic light experience. The Wabash Lights’ LED tubes will be customizable in color, duration, brightness, and cadence. Typical light installations are created by a singular, commissioned light artist and pre­-programmed to run a set sequence. The Wabash Lights website will seek submissions from citizens of Chicago and the world to program snapshots, sequences, and interactivity into the canvas of light. Wabash Lights designers Jack C. Newell and Seth Unger will lead a progressive discussion to explain the concept, logistics, and engage the audience in an interactive discussion about this transformative, inclusive, and first­ of ­it’s­ kind piece of public art. Food and drink will be served. This article may blow your mind! A Microsoft-funded venture is aimed at designing computers that can solve problems in fields as diverse as chemistry, material science, artificial intelligence and code-breaking. Communication regarding the event will only be sent through CPS email including notification if you are invited to attend.